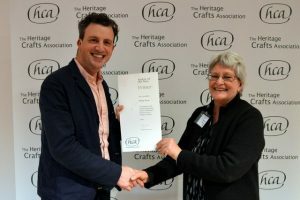 Hilary has been a highly-regarded member of the basketmaking community for many years and was awarded Maker of the Year in recognition of a number of recent projects that have put British basket making, and heritage crafts in general, at the centre of public consciousness. These have included ‘Baskets of the British Isles, an installation of 52 styles of traditional British baskets hanging over the lobby bar of the Whitby hotel in Manhattan, for which she also produced an accompanying book, and the ‘Our House’ project at Selfridges. Hilary also ran the ‘Out of the Woods’ tent at the Contemporary Craft Festival and was the initial project manager of the University of Hertfordshire ‘Basketry Then and Now’ project looking at the role of basketry in World War One, for which she ran a unique class in pigeon basket making.